Umas décadas antes do holocausto que constantemente preenche as páginas dos jornais e as telas do cinema, um outro levou à morte de centenas de milhares, senão de milhões, de pessoas. Uma etnia vítima do homicídio industrial e calculado e cuja memória é constantemente esquecida pelo mundo. Inclusivé pelos descendentes dos criminosos que o fizeram, o Império Otomano. Se em alguns países, a negação do holocausto arménio é crime, na moderna Turquia a menção deste crime pode resultar em detenção, como aconteceu ao escritor alemão-turco Dogan Akhanli, ou em complicados processos judiciais, como foi o caso do prémio Nobel da literatura Orhan Pamuk. Mas os Arménios são um povo pequeno, pouco influente e sem lóbies poderosos. Deles não dependem eleições das maiores potências do mundo. E a este povo, sobreviventes e descentes do genocídio que em breve será centenário, nunca foram pagas restituições. A Síria, como o Líbano, a Palestina e outros países do Médio Oriente, receberam involuntariamente muitos dos refugiados durante 1915. Hoje as suas vidas voltam a estar em risco, quando a Síria atravessa uma guerra civil que será lembrada durante muito tempo. Onde as minorias religiosas parecem estar cada vez mais frágeis. E onde estes descendentes de refugiados provavelmente tornar-se-ão refugiados eles próprios. Deixo aqui mais um artigo de Robert Fisk, no jornal britânico The Independent sobre os Cristãos Arménios Sírios. queimada depois de combates entre o exército Sírio e forças rebeldes. Just over 30 years ago, I dug the bones and skulls of Armenian genocide victims out of a hillside above the Khabur River in Syria. They were young people – the teeth were not decayed – and they were just a few of the million-and-a-half Armenian Christians slaughtered in the first Holocaust of the 20th century, the deliberate, planned mass destruction of a people by the Ottoman Turks in 1915. It was difficult to find these bones because the Khabur River – north of the Syrian city of Deir ez-Zour – had changed. So many were the bodies heaped in its flow that the waters moved to the east. The very river had altered its course. But Armenian friends who were with me took the remains and placed them in the crypt of the great Armenian church at Deir ez-Zour, which is dedicated to the memory of those Armenians who were killed – and shame upon the “modern” Turkish state which still denies this Holocaust – in that industrial mass murder. And now, almost unmentioned in the media, these ghastly killing fields have become the killing fields of a new war. Upon the bones of the dead Armenians, the Syrian conflict is being fought. And the descendants of the Armenian Christian survivors who found sanctuary in the old Syrian lands have been forced to flee again – to Lebanon, to Europe, to America. The very church in which the bones of the murdered Armenians found their supposedly final resting place has been damaged in the new war, although no one knows the culprits. Yesterday, I called Bishop Armash Nalbandian of Damascus, who told me that while the church at Deir ez-Zour was indeed damaged, the shrine remained untouched. The church itself, he said, was less important than the memory of the Armenian genocide – and it is this memory which might be destroyed. He is right. But the church – not a very beautiful building, I have to say – is nonetheless a witness, a memorial to the Holocaust of Armenians every bit as sacred as the Yad Vashem memorial to the victims of the Jewish Holocaust in Israel. And although the Israeli state, with a shame equal to the Turks, claims that the Armenian genocide was not a genocide, Israelis themselves use the word Shoah – Holocaust – for the Armenian killings. In Aleppo, an Armenian church has been vandalised by the Free Syrian Army, the “good” rebels fighting Bashar al-Assad’s regime, funded and armed by the Americans as well as the Gulf Sunni Arabs. 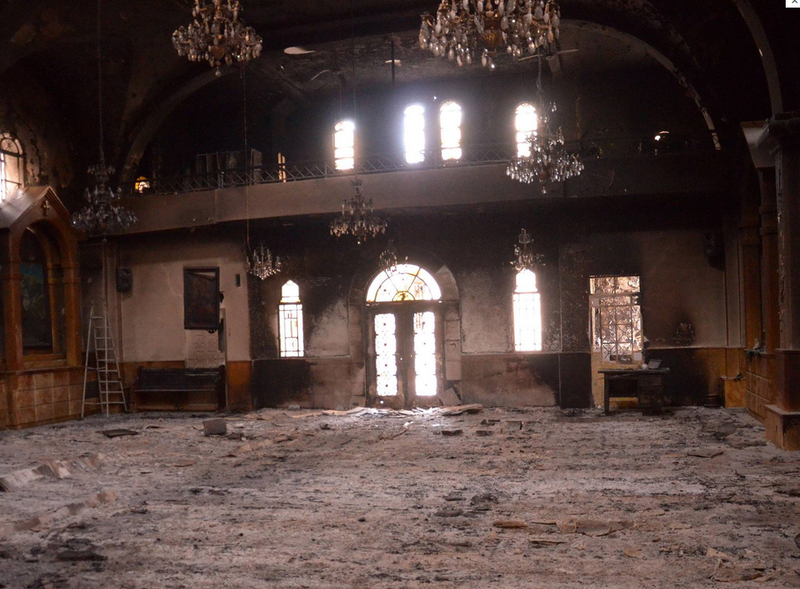 But in Raqqa, the only regional capital to be totally captured by the opposition in Syria, Salafist fighters trashed the Armenian Catholic Church of the Martyrs and set fire to its furnishings. And – God spare us the thought – many hundreds of Turkish fighters, descendants of the same Turks who tried to destroy the Armenian race in 1915, have now joined the al-Qa’ida-affiliated fighters who attacked the Armenian church. The cross on top of the clock tower was destroyed, to be replaced by the flag of the Islamic State of Iraq and the Levant. Nor is that all. On 11 November, when the world honoured the dead of the Great War, which did not give the Armenians the state they deserved, a mortar shell fell outside the Holy Translators Armenian National School in Damascus and two other shells fell on school buses. Hovhannes Atokanian and Vanessa Bedros, both Armenian schoolchildren, died. A day later, a bus load of Armenians travelling from Beirut to Aleppo were robbed at gunpoint. Two days later, Kevork Bogasian was killed by a mortar shell in Aleppo. The Armenian death toll in Syria is a mere 65; but I suppose we might make that 1,500,065. More than a hundred Armenians have been kidnapped. The Armenians, of course, like many other Christians in Syria, do not support the revolution against the Assad regime – although they could hardly be called Assad supporters. Two years from now, they will commemorate the 100th anniversary of their Holocaust. I have met many survivors, all now dead. But the Turkish state, supporting the present revolution in Syria, will be memorialising its victory at Gallipoli that same year, a heroic battle in which Mustafa Kemal Ataturk saved his country from Allied occupation. Armenians also fought in that battle – in the uniform of the Turkish army, of course – but I will wager as many dollars as you want that they will not be remembered in 2015 by the Turkish state which was so soon to destroy their families. While we all bask in the glow of happy relations with Iran, it might be well to read – in four months’ time, unless their publishers have the common sense to bring it forward – a remarkable book by Shane Bauer, Josh Fattal and Sarah Shourd. They – and you may not remember this – were the hitchhikers who “strayed” into Iran in 2009 from Iraqi Kurdistan. Sarah (pictured below with Shane) was released first and she called me on the phone to talk about her fiancé, Shane, and to ask if The Independent could help secure the two men’s release. We published some of Shane’s journalism – I made a point of telling the Iranian ambassador in Beirut to read it – and, with or without The Independent’s help, they were both released. I was delighted. They had been arrested during the presidency of the lunatic Ahmadinejad, and it’s clear from their book that they were lured over the border by Iranian frontier guards. One of them eventually emailed Sarah that this was the case. But their incarceration, their vicious solitary confinement – a form of torture if ever there was one – and their relations, not just with their fellow condemned prisoners but with their guards, is a remarkable story. Sarah quickly worked out, back in freedom, that the US government was not their natural friend; there are some sharp words about the “peacemaker” Dennis Ross. A good book – which I rarely say – and it’s called A Sliver of Light. A Fisk read.